FRESNO – More than 3,400 third-grade students and 680 teachers and chaperones from throughout Fresno County will participate in the ninth annual Farm & Nutrition Day at the Fresno Fairgrounds, located at Butler and Chance avenues, on Friday, March 21, from 9 a.m. until 12:45 p.m. 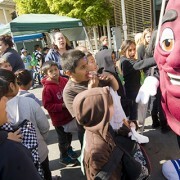 The one-day, interactive educational experience is sponsored by Fresno County Farm Bureau and the Big Fresno Fair. Students, chaperones and teachers will have the opportunity to take part in more than 50 demonstrations and booths, which focus on how food is produced, the diversity of Fresno County agriculture and nutritional information. Participants will learn about the abundant agricultural industry in Fresno County, agricultural career opportunities and how to make healthy food choices. In addition, more than 60 volunteers will help at the event. Several businesses and individuals are financially assisting with school transportation and other costs. Farm Day 2014 will provide students and teachers the opportunity to learn about food, fiber and animal production, meeting one-on-one with farmers and ranchers, resources managers and food and agricultural industry representatives. In addition, students will be able to taste healthy fruits and vegetables provided in the Tasting Center. For additional details, contact the Fresno County Farm Bureau at (559) 237-0263 or info@fcfb.org. Fresno County is the nation’s number one agricultural county, producing more than 400 commercial crops annually, totaling more than $6.58 billion in gross production value in 2012. This event offers students a glimpse into the agricultural world of Fresno County. The 3,400 students participating in the 2014 Farm & Nutrition Day are from 44 different schools in 9 school districts across Fresno County.